Apricot is also commercially grown at varying elevations in the warmer region of the Himalayan hills, Kashmir, submountaneous tracts of Uttar Pradesh and Himachal Pradesh. Low-chilling varieties can be grown in the hills of Madhya Pradesh and plains of Punjab and Haryana. In Punjab, it is even grown in Amritsar, Hoshiarpur, Pathankot, Chandigarh and Patiala districts alongwith mango and oranges. Apricot requires somewhat heavy textured soils but it is sensitive to waterlogging. It grows well on deep, fertile and well-drained, loamy soils. 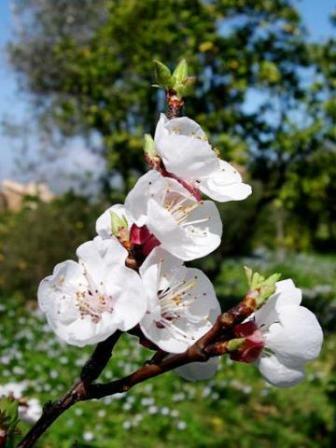 For successful cultivation, apricot requires frost-free locations because low temperature is a limiting factor for its proper flowering and fruiting. Places where temperature during blooming period is likely to fall between -2.8` to -5.6`C not suitable for its cultivation. Long cool winter and uninterrupted warm spring are favorable for its fruiting. It requires less chilling period than most of the peaches. Cultivars with moderate chilling requirement are New Castle, Early Shipley, St. Ambroise and Kaisha. A selection at Abohar in Punjab has been found to be very promising for the jplains. And introduction from Pakistan at Patiala in Punjab known as Benazir flowers and fruits profusely and ripen in the first fortnight of May. Three hybrids—Chaubattia Alankar, Chaubattia Madhu and Chaubattia Kesri—have been released for commercial cultivation. They are regular- bearer, low-chilling, high –yielding and ripen during May-end to first week of June. Apricot is propagated like peach and plum. 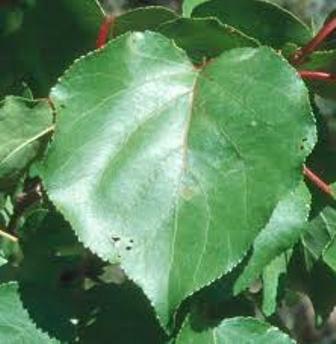 In plains, it is commercially propagated by shield budding during July-September on peach or plum rootstock. During dormant season (December- February) one –year-old peach or plum seedlings can be cleft grafted. 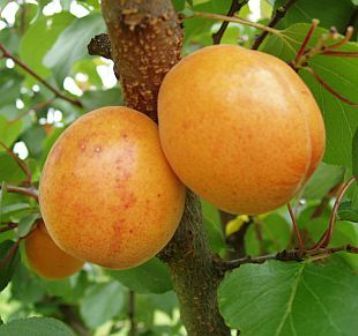 Peach rootstock is suitable for light soils, whereas plum for heavy and wet soils. One-year-old healthy grafted plants should be planted in the field 6m x 6m apart in square system during December-January. Apricot trees are trained to modified leader system almost similar to that of peach and plum. Bearing apricot trees are pruned lighter than peach. They bear fruits on previous year’s growth and short spurs. The spur bearing branches die after 4-5 years. Therefore pruning should be done aimed to induce new growth on such braches and to provide fruiting spurs for the subsequent years. It consists of cutting back and thinning out 1-3 years old wood and has balanced vegetative growth. Diseased, weak, broken or criss-cross branches should be pruned back during January-end to second week of February to encourage production of more fruiting spurs. A dose of 10 kg farmyard manure, 50g N, 25 g P2O5 and 60 gK2O is recommended to one year-old plants. Increase the dose of farmyard manure@ 5kg /tree and, N,P and K at above rates up to 10 –year-old trees. Apply farmyard manure in December –January along with P and K. Apply half N in spring before flowering and the remaining half a month later. A pre-emergence application of Simazine of Diuron @ 4-6 /ha is very effective to control a wide variety of weeds. The fruits are plucked when they change color from green to yellow, lose flesh firmness and develop high TSS. For distant markets, fruits should be hand picked individually at semi-hard stage when they develop green to amber color. Keep them in a cool place and pack in perforated cardboard cartons of 1-4 kg capacity with straw cushion. Care should be taken that the damaged fruits are not packed with healthy ones. Fruits harvested at optimum maturity can be stored for a week at 5`C and 85 % relative humidity. 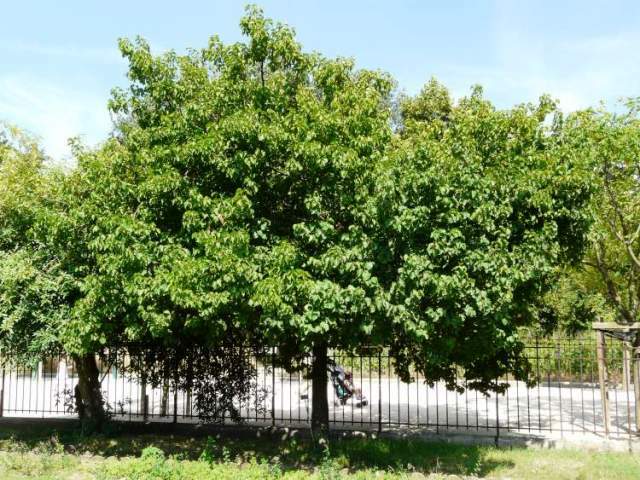 A 5-year-old tree may provide 35 kg fresh fruits. The fruits become ready for picking from first week of May to mid-May.